The Wichita city council should repeal a law that the council doesn’t follow. As he has done previously, Wichita Mayor Carl Brewer decided not to vote on a matter involving Spirit Aerosystems at the November 4, 2014 meeting of the Wichita City Council. The mayor didn’t give a specific reason for recusing himself, but it’s probably because he was formerly an employee at Spirit. So it’s good that he did this. But if we’re going to observe ethics protocols like this — and we should — let’s go all the way. The mayor should have announced at the start of this agenda item that he had to recuse himself, and then he should have left the bench and probably also the council chambers. Instead, Brewer presided over the presentation and discussion of the item, and then stated he wouldn’t be voting. It’s a small matter, but we might as well do things right. What is much more important — and equally difficult to understand — is this: Brewer feels he can’t vote on an item involving a company where he was an employee long ago, but he has no qualms about voting on matters that send taxpayer money to his fishing buddy, even through overpriced no-bid contracts. Even more curious: Brewer thought it was ethical to vote to send taxpayer money to the movie theater owner who also sells his barbeque sauce. Add this to the confusing mix of ethical judgments: The mayor feels he can’t shop for his personal automobile in Wichita because he doesn’t want to be accused of getting a “special deal,” in his words. If someone can explain this line of reasoning by the mayor and/or the city, I’d appreciate being enlightened. It’s good to know that Mayor Carl Brewer is concerned about ethical behavior when shopping for a car or voting on matters concerning his former employer. But I’m surprised, as this concern for virtue doesn’t match the behavior of the mayor and many members of the Wichita City Council. Shall we run down the list? Exhibit 1: In August 2011 the Wichita City Council voted to award Key Construction a no-bid contract to build the parking garage that is part of the Ambassador Hotel project, now known as Block One. The no-bid cost of the garage was to be $6 million, according to a letter of intent. Later the city decided to place the contract for competitive bid. Key Construction won the bidding, but for a price $1.3 million less. Wichita mayor Carl Brewer with major campaign donor Dave Wells of Key Construction. The no-bid contract for the garage was just one of many subsidies and grants given to Key Construction and Dave Burk as part of the Ambassador Hotel project. Both of these parties are heavy campaign contributors to nearly all city council members. Brewer and the head of Key Construction are apparently friends, embarking on fishing expeditions. 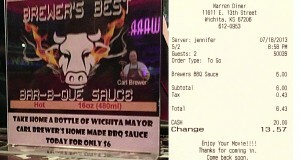 What citizens need to know is that Brewer and the Wichita City Council were willing to spend an extra $1.3 million of taxpayer money to reward a politically-connected construction firm that makes heavy campaign contributions to council members. Only one council member, Michael O’Donnell, voted against this no-bid contract. At the time, no city bureaucrats expressed concern about this waste of taxpayer money. Exhibit 2: In July 2012 Brewer participated in a decision to award the large contract for the construction of the new Wichita airport to Key Construction, despite the fact that Key was not the low bidder. The council was tasked to act in a quasi-judicial manner, to make decisions whether discretion was abused or whether laws were improperly applied. Brewer’s judgment was in favor of Key Construction, even though its bid had the same defect as the lower bid. This decision cost taxpayers and airport users an extra $2 million, to the benefit of a major campaign donor and fishing buddy. Warren’s theaters and other business ventures have received other financial benefits from the city under Brewer’s leadership, too. Then — and I swear I am not making this up — when Brewer started manufacturing and selling barbeque sauce, it was sold at Warren’s theaters. Exhibit 5: Given all this, Mayor Brewer saw it fit to praise Wells and Burk at the city council meeting on December 16, 3014. Effusively praise the two, that is. Also, Bill Warren –the owner of the movie theater that sells the mayor’s barbeque sauce — is a partner in this apartment project. What can we say about a mayor who is concerned about the appearance of impropriety when voting on economic development incentives for his former employer, but is not able to understand the problems with his own behavior in office? How can a person decide he must shop for a car outside the city, but votes for overpriced no-bid contracts for campaign contributors and friends? 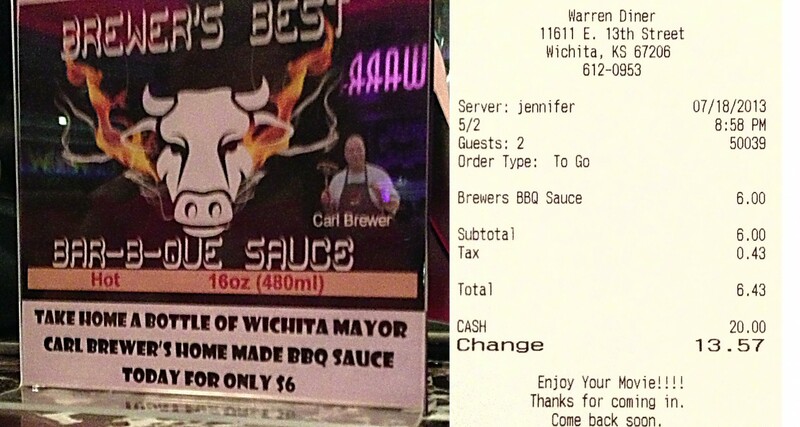 Why would an elected official decline to vote on a tax break to his former employer, but votes to give millions to a campaign contributor, and then sells his barbeque sauce in that person’s business? How can someone justify participating in a quasi-judicial hearing involving his campaign contributors and friend involving a large city contract? It’s difficult to understand or reconcile these decisions. Presentation by city attorney to Wichita city council, November 2013. There is a law in Wichita. 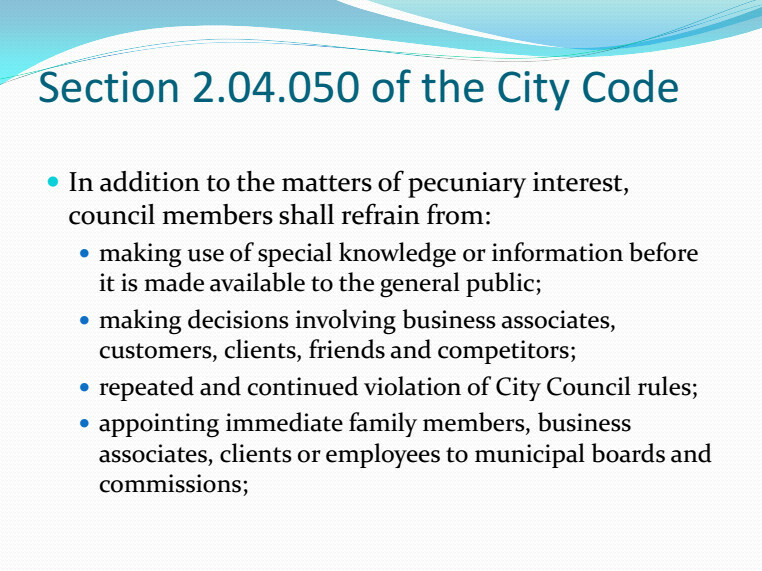 There is a city code that reads “[Council members] shall refrain from making decisions involving business associates, customers, clients, friends and competitors.” Mayor Brewer voted for that law in 2008. But the former city attorney felt that council members did not need to follow that law. When someone called attention to this law at a city council meeting when the mayor was about to award incentives to his fishing buddy, he threatened to sue the speaker. See Wichita Mayor Carl Brewer on public trust in government. If the former city attorney’s interpretation of this law is correct and city council members do no need to follow this law, the city needs to do something. 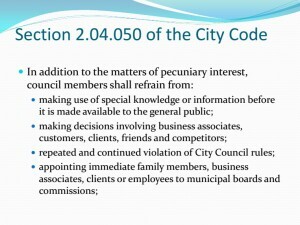 The council needs to repeal this section of the city code. There’s no need to have such a law if council members don’t have to obey. Also, someone who reads this — perhaps a business owner considering Wichita for expansion — might conclude that our city has a code of ethics that is observed by the mayor and council members and enforced by its attorneys. But giving that impression would be false.